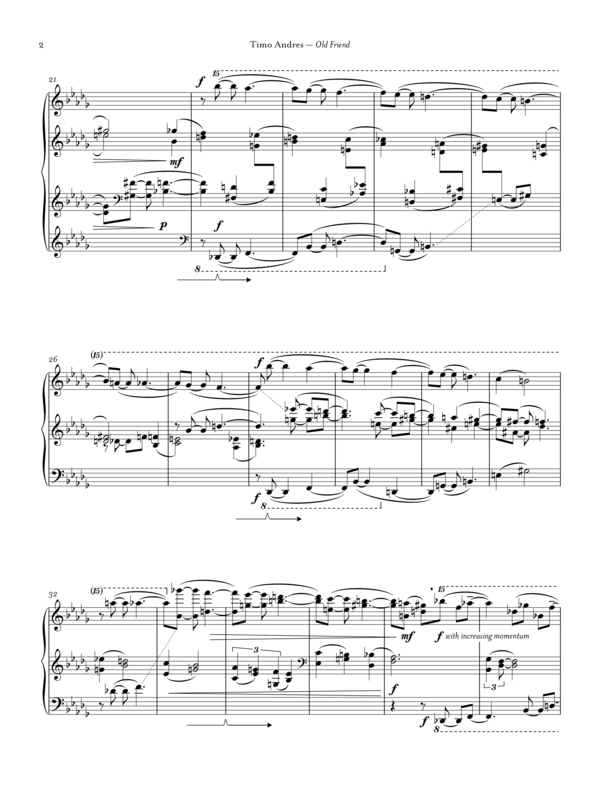 Old Friend starts with a big section based on a skeletal melody I extracted from Chopin’s third scherzo. Starting at opposite ends of the keyboard, both two hands move toward each other at the center. When they meet, they continue downward—but the melody also starts again at both ends, displaced by half a beat. These indi­vid­ual entrances—a canon of sorts—build up momentum, volume, and harmonic density, and things start to go a bit haywire. New canonic entrances start to appear where they shouldn’t, certain lines accel­er­ate wildly, and before long it’s a snarl of notes, octaves and arpeg­gios moving up and down the keyboard all at once, crossing each other and starting again. 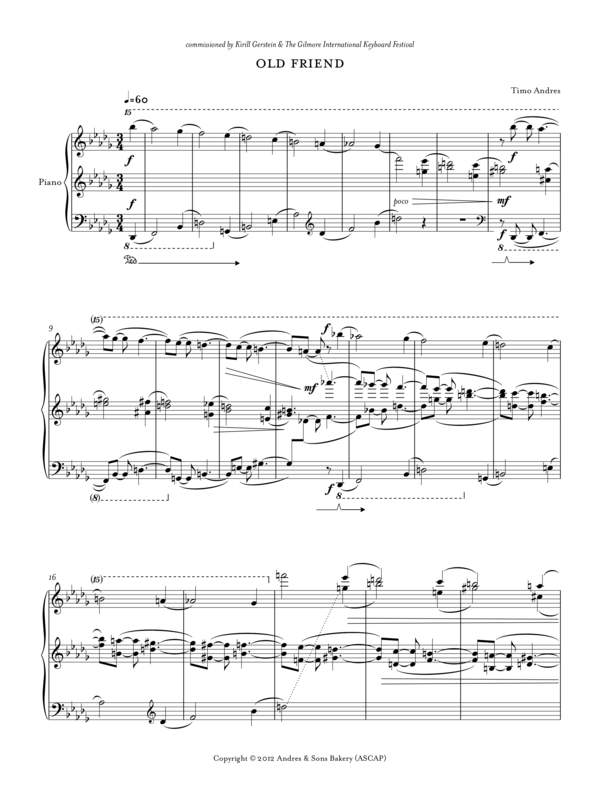 Through this first section, the rising left hand notes grad­u­ally morph into their own new idea—a cycle built from five-note groups which is like a machine for changing keys, constantly doubling back on itself, rising and falling unpre­dictably but always in strict rhythm. Before too long, these quin­tu­plets are the only thing going, first loud and bril­liant, rising to the very top of the keyboard, then mirrored by a soft and gentle response. The quin­tu­plets wind down, leaving the music open and spare. A new version of the opening melody is played very high, but it has a new char­ac­ter, stum­bling back, lurching forward, and not quite settling into a follow­able rhythmic groove. Canonic voices even­tu­ally coalesce, and the music becomes more of a chorale—that is, inde­pen­dent voices moving in harmonic and rhythmic unity. It’s a fugue, actually, though each new appear­ance of the subject finds it slightly differ­ent, as well as trans­posed by a half-step. After winding itself up and becoming quite loud, the fugue trails off slowly, over­taken by a lullaby-like sequence. 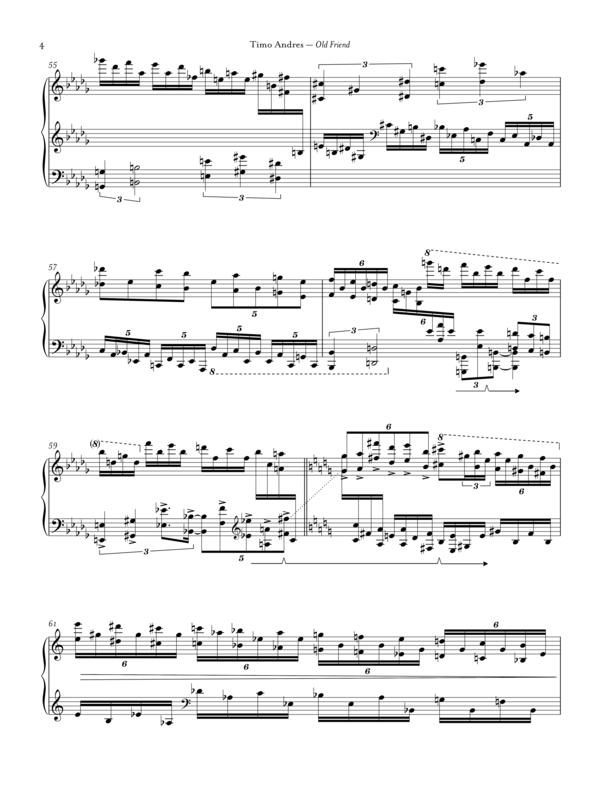 There is an almost-refer­en­tial quality to this music, as though it could be from a 19th-century waltz—expect it’s not formed into predictable units of eight and sixteen bars, instead wander­ing slowly down the keyboard, growing hazy in a wash of grace-notes in differ­ent keys. 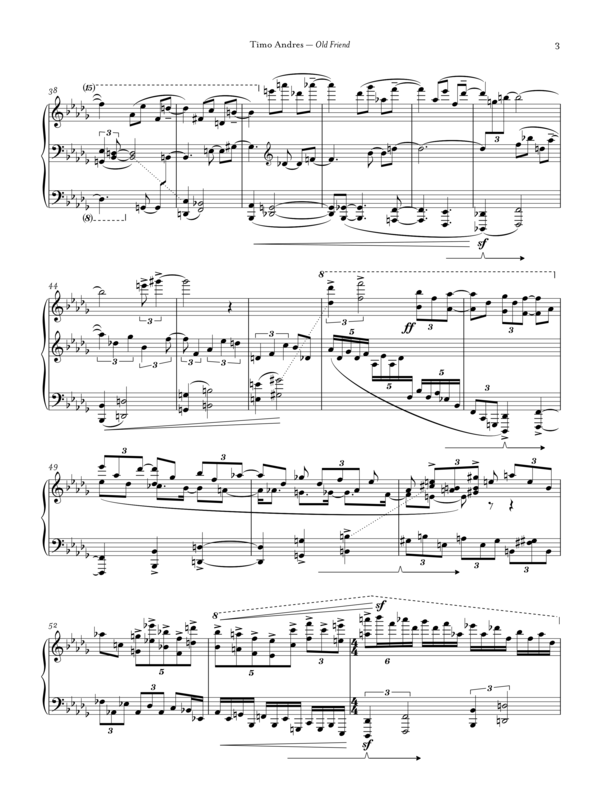 This waltzy music is answered by a low chorale, building in volume and harmonic inten­sity over several iter­a­tions to a rather brash state­ment of Chopin’s original chorale (with a few extra notes added). The end is a mirror image of the big, virtu­osic opening section—only now it’s extremely quiet, both hands gliding over the keyboard at inde­pen­dent speeds, crossing each other, and going back the other way. It’s all built from the same stuff, but now those arpeg­gios sound open, distant, almost Impres­sion­is­tic. Even the harmonic machi­na­tions of the quin­tu­plets simply drift away—we’re hearing them from a distance now, and they become a single, large shape.